Site sponsor HobbyLink Japan is having sales on some fan favorite mobile suit items, from Gundam! Anything from Mobile Suit in Action! Extended, HCMpro, Robot Damashii SIDE MS, Real Grade Gundam models, Perfect Grade, Master Grade, et al, are on sale! 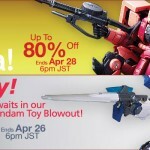 Head on over there to save big on mobile suits!